On Saturday 9th February 2019 during Children’s Mental Health Week, all 163 The Entertainer stores across the UK hosted The Big Create, a fun and engaging colouring-in and dough making session that took place between 12-4pm. 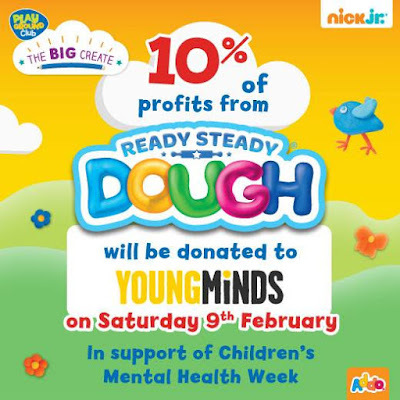 What’s more, 10% of all profits of the Nick Jr. Ready Steady Dough lines by Addo Play sold both instore and online at TheToyShop.com on this day will be donated to Young Minds. The Big Create took place in all 163 The Entertainer stores across the UK on Saturday 9th February between 12-4pm. Families are encouraged to share their creations on social media using #TheBigCreate. The Entertainer was founded in 1981 in Amersham, Buckinghamshire by husband and wife team, Gary and Catherine Grant, who now with two of their sons, instil the driving force and mission – “To be the best-loved toyshop – one child, one community at a time”. Today, it continues to be the largest family-owned toy retailer in the UK with a total of 163 stores. As well as a strong High Street presence, The Entertainer has a successful website (TheToyShop.com) which offers a 30-minute click and collect service and has 30 million visits annually and growing. The Entertainer is also recognised for its charitable giving. Each year it tithes 10% of its pre-tax annual profit to charity, in addition employees are encouraged to donate directly through Payroll Giving. The Entertainer is also an active member of the Pennies scheme, the digital upgrade of the traditional charity collecting box, which enables customers to donate a few pence to charity at the point of sale when paying by card. On average, this generates £12,000 of customer donations to Children’s hospitals each week. The Entertainer currently employs 1442 staff across the stores and a further 228 in the Head Office in Amersham, Buckinghamshire. The Entertainer was awarded Specialist Multiple Toy Retailer of the Year and, Overall Toy Retailer of the Year in the Toy Industry Awards. The Entertainer was also ranked 69th in the prestigious Sunday Times “100 Best Companies to work for” in 2018. Original source: Toy World Magazine.